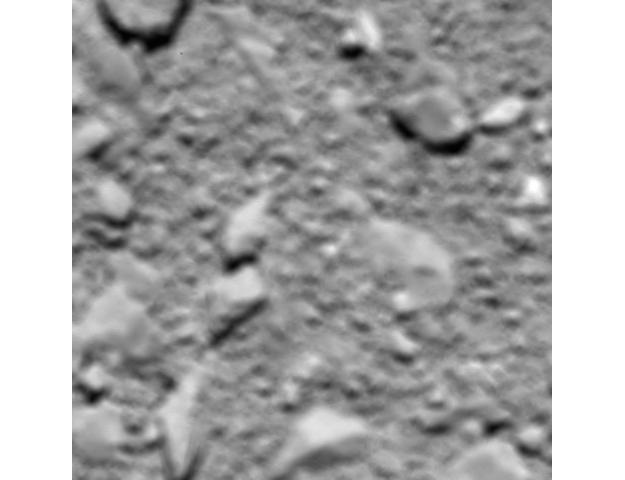 Rosetta's last image of Comet 67P/Churyumov-Gerasimenko, taken with the OSIRIS wide-angle camera shortly before impact, at an estimated altitude of 23.3–26.2 m above the surface. The initially reported 51 m was based on the predicted impact time. Now that this has been confirmed, and following additional information and timeline reconstruction, the estimated distance is now thought to be around 20 metres, and analysis is ongoing. The image scale is about 2 mm/pixel and the image measures about 96 cm across. This image also features as the last entry in the OSIRIS Image of the Day archive.